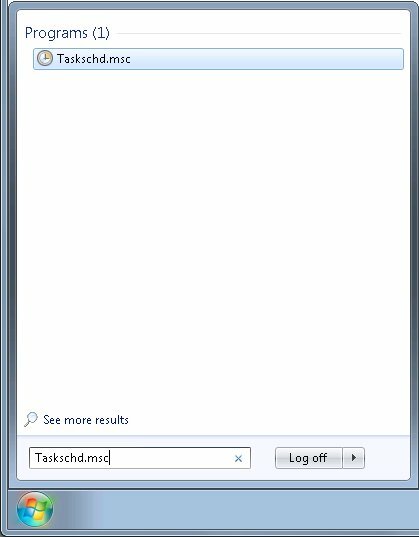 Since the dawn of time, the easiest way to start a Windows program when you log on is to place a shortcut to the program in your Startup folder. 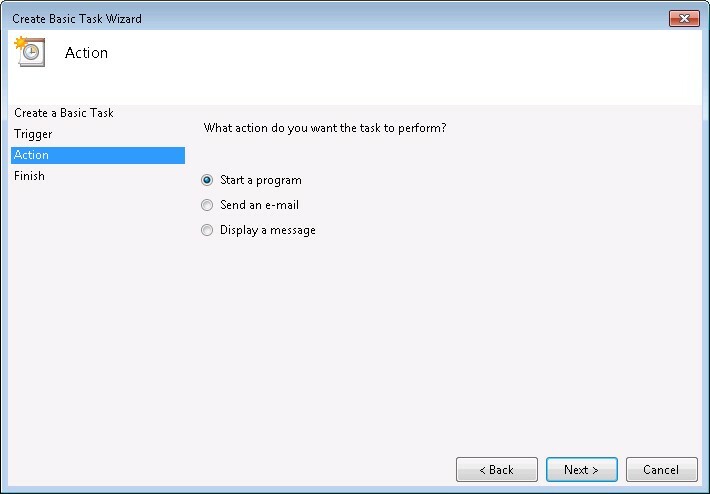 This continues to work fine for regular applications, but with the advent of User Account Control (UAC) in Vista and Windows 7, administrative applications (like AlwaysUp) placed in the Startup folder will now throw up the intimidating UAC prompt, interrupting the smooth automatic starting of your application. Phooey! 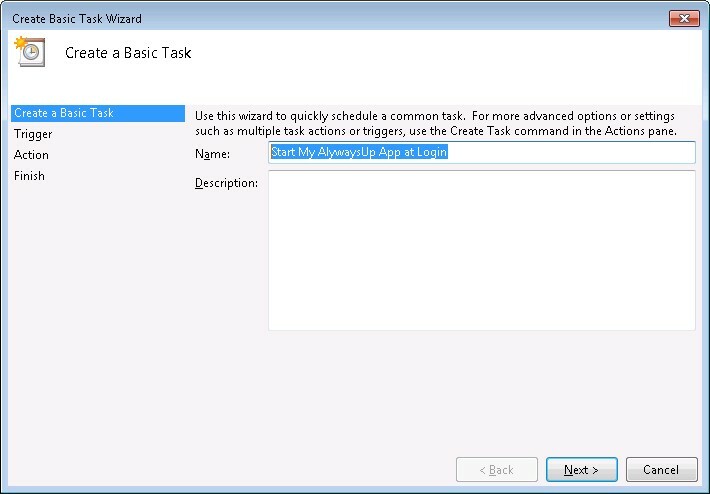 Select Action > Create Basic Task... to open the Create Basic Task Wizard window. In the Name field, enter the name for the new task. 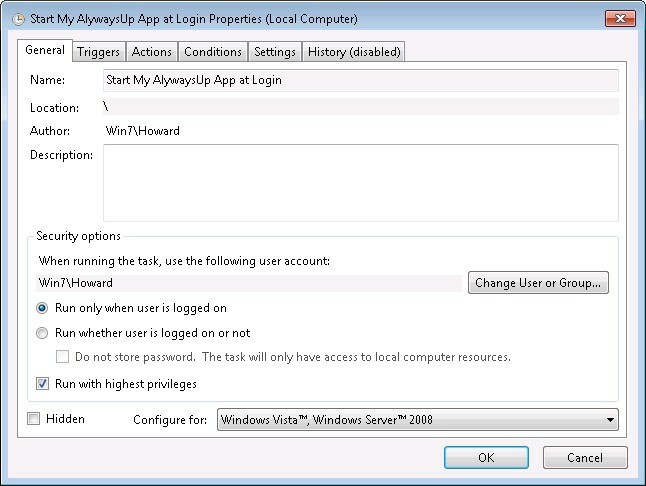 We have specified Start My AlwaysUp App at Login but you can specify almost anything you like. 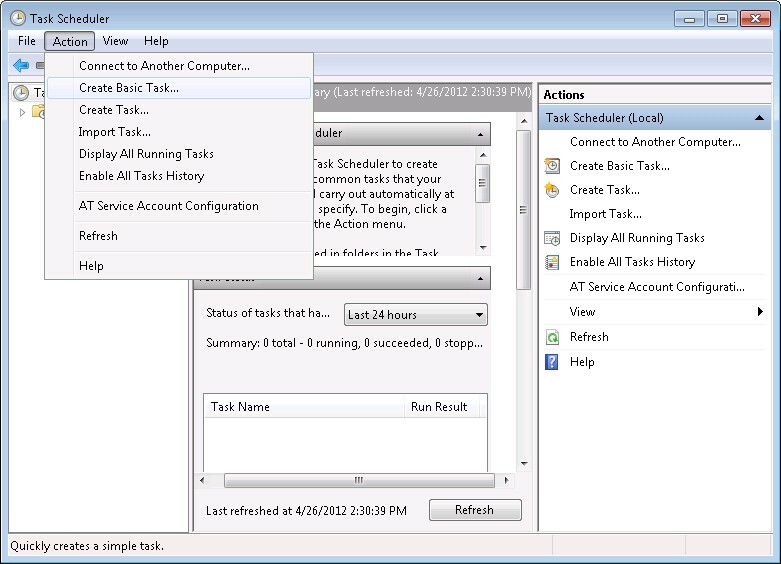 Specify when the task should be started. 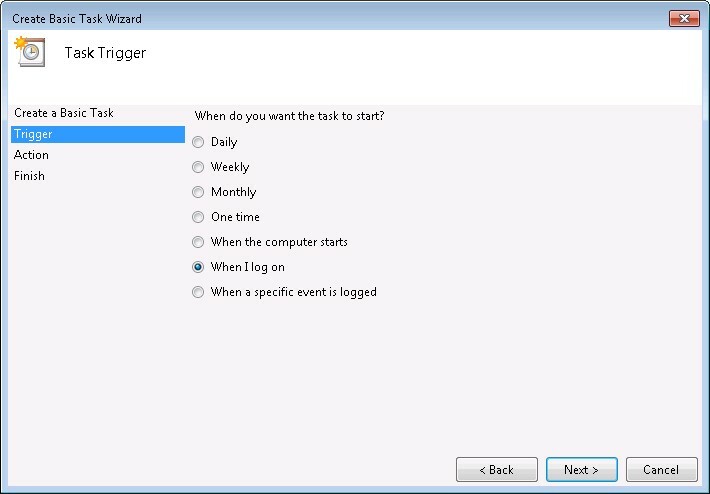 Select When I log on. Specify what the task should do. Leave the selection at the default, Start a program. 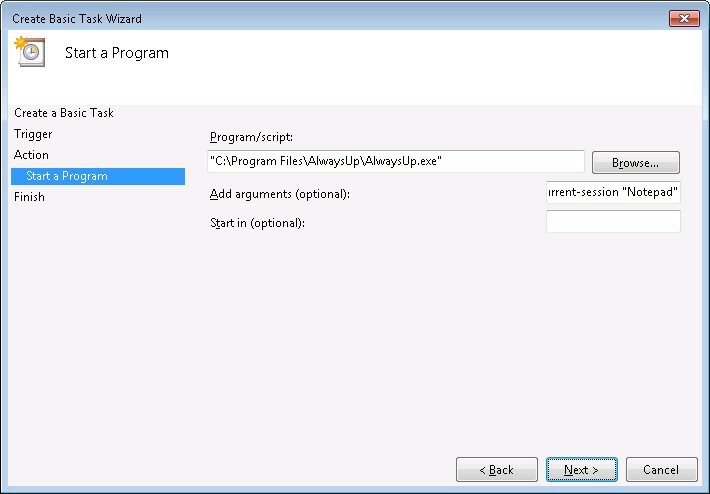 Next, we specify that we would like to run AlwaysUp (with special command line flags to restart your application in the session). 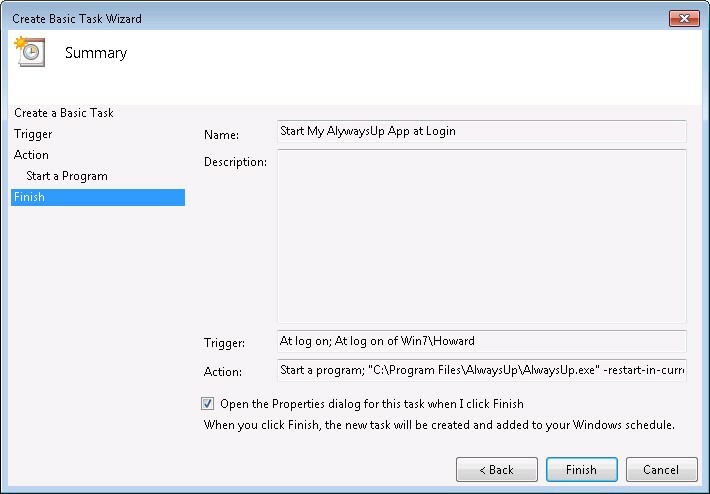 where MyAppName is the name of your application in AlwaysUp. Be sure to put quotes around the name if it contains spaces! Almost done! Check the Open the properties dialog for this task when I click Finish near the bottom and click the Finish button. On the properties window that comes up, check the Run with highest privileges box. This is the magic necessary to avoid the annoying UAC Prompt when you log in. Application not starting properly when you log on?